What we need to know is whether your child/children will be here every day or a specific number of days. Parents pay for the days used. For those who use the after school care every day, the fees remain the same. Those fees are set according to the number of school days. Everyone using After Care Program must complete the registration forms and pay the registration fee. If you contract for two days a week and need three, it will be available but there will be an extra charge. It is a minimum for two days per week. We ask that you pay your weekly fee in advance on the preceding Friday. A $5.00 late fee will be charged if payments are more than two (2) weeks late. Checks are to be payable to “Holy Childhood School” and given to the Aftercare staff or to the school office in an envelope marked Aftercare. The program will be supervised by hired personnel here at Holy Childhood School. A flexible schedule is planned weekly by the staff and will include snack, indoor and outdoor playtime, quiet homework time, crafts, games, puzzles and other activities. An Application Form, Attendance Schedule and Registration Agreement needs to be completed by parents of all participants. Any Holy Childhood School student may use the program for as many hours and/or days needed as provided by the program. If you have any questions, comments or concerns, please call Mrs. Dougherty, Principal, at 566-2922. Aftercare ends at 6:00 p.m. All children must be picked up no later than 6:00 p.m. If you are late picking up your child, a late fee of $5.00 will be charged for each 15 minutes (or fraction there of) you are late. When Holy Childhood School is closed due to snow or ice, there will be no Aftercare. Only those people authorized by you on your pick up list will be allowed to pick up your child. We ask that you sign your child out each day. 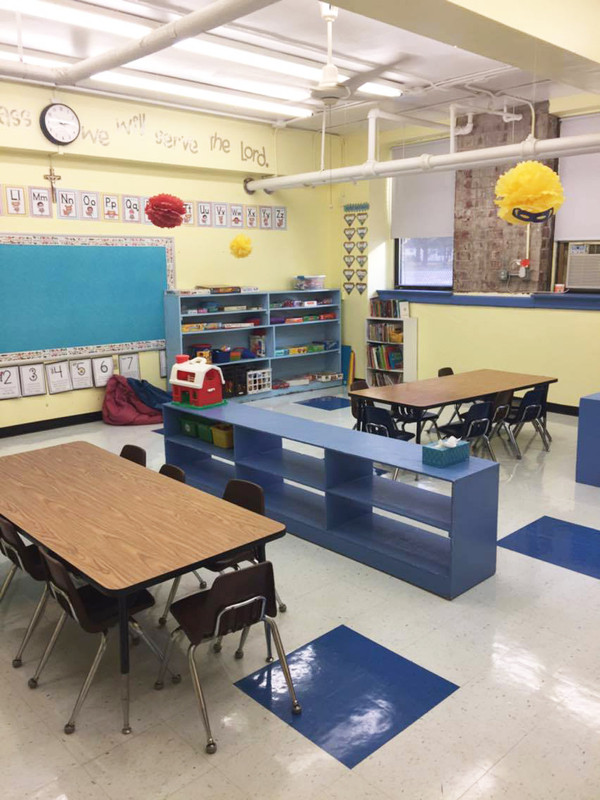 Students participating in the Holy Childhood School Aftercare Program will be expected to obey and respect all staff and students in our program. They will follow the same school rules, policies, dress code and conduct that they follow during the regular school day. This policy will be firmly enforced so as to ensure the best experience for all children and staff. All children are registered on a trial basis. If the program does not meet your child’s needs or your child is unable to adapt to the program, a conference will be held first with the Aftercare staff, and if necessary, with the principal to correct any problems that may occur. Our ultimate concern is your child’s safety and well being. Your cooperation is essential for the success of our program. If medication is required during Aftercare hours, only prescription medication may be dispensed. A signed note from parents or guardians giving permission to give medication, including the time, date, and amount to be given, must accompany medication. The Medication Consent Form at the end of this handbook needs to be completed by the parent or guardian. Holy Childhood School Aftercare Program is available every school day from 3:00 to 6:00 p.m. full school days only. Only Holy Childhood School students may participate. On early dismissal days, there will be no Aftercare.